A healthy breakfast in the morning is important, as it gives you energy, boosts your brain power, and stops you from getting hungry before lunch. In addition to this, it is seen that people who consistently eat a nutritious, healthy breakfast tend to be slimmer than those who don't. 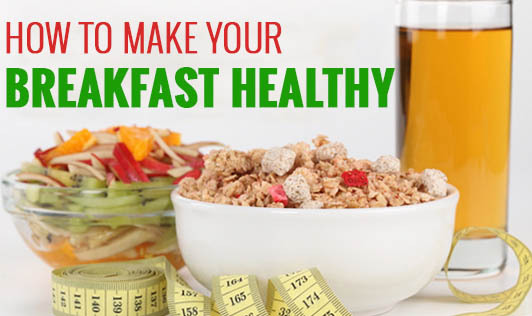 So here are a few tips to help you make your breakfast healthy. • Add Nutrients to Your Healthy Cereal- Instead of having just plain cornflakes or wheat flakes with milk, add a fruit or yoghurt (instead of milk), or nuts to it. This combination helps you get a good amount of fiber, protein, gut-healthy bacteria, calcium, potassium, and good quality fats along with energy. • Get a Fruity Start- Bored of cornflakes every day? Switch to fruit- yoghurt or a fruit-milk meal. Mix fruits of your choice with a low-fat, no-sugar yoghurt, drizzle a little honey and top it with some toasted almonds. The combination of fruit, yoghurt, honey, and nuts make this breakfast high in protein and volume, guaranteed to help you feel full longer. • Don't Skip Those Eggs- Eggs are a good source of protein, vitamin B12, folic acid, vitamin D, and Vitamin A. One egg omelet or 2 egg whites on a piece of toast is enough to keep you going. • Wrap Up Those Leftover Chapattis- Use those overnight leftover chapattis to make your very own healthy frankie. Stuff the chapatti with some paneer or egg, top it up with some fresh veggies and ketchup and spice up your breakfast! • Add Paneer- Vegetarians can increase their protein intake, by including paneer in their breakfast. Use it as a stuffing or just have it along with fruits. • Don't Rule Out the Vegetables- Always include vegetables in your breakfast. Add them to your scrambled eggs, use them in your stuffing, or just lightly steam and have it as a side dish.